Princess Diana: Princess Diana Murder: Tale Of Two Spooks Who Dared To Cry Foul! Princess Diana Murder: Tale Of Two Spooks Who Dared To Cry Foul! Princess Diana Death: Intelligence Agencies Turn On Their Own! Former MI6 operative Richard Tomlinson for several years now has been hounded by the very same agency that he dedicated his life! Why? Because he dared to voice dismay and disgust at some of their methods and policies namely those of assassinating foreign heads of state and other dignitaries. Richard Tomlinson was employed by MI6 from September 1991 to April 1995. By all accounts his was an exemplary career in MI6. He was part of a highly successful and complicated mission to smuggle nuclear secrets and advanced soviet weaponry out of the then disintegrating Soviet empire. Tomlinson was also involved in another vital and hugely successful mission that involved deactivating a criminal organization that was attempting to smuggle chemical weapons into Iran! So with all this success under his belt why would MI6 get rid of him? After all it costs a bucket load of money to train an agent of Tomlinson's caliber! The Intelligence Business by its very nature is an ugly business. There are no rights or wrongs, no absolutes of black or white, only unending shades of gray! If one wishes to be truly successful at this kind of business then it's best to park your scruples and conscience outside before you step in. Why? Because absolute loyalty is a must and somewhere along the line you're going to be asked to do something ugly and evil! Something like kill innocent people, bump off democratically elected heads of state and if necessary kill off a few kids to boot! This kind of business as you can see has no time or place for morality. With all that sordidness flying about it is absolutely imperative that the public never ever get to know the "price of their freedom"; that's why revelation of national secrets by a government agent falls under treason and at its most severest is punishable by death! Fired For Not Wearing A Tie To Meet War Criminal! Ostensibly the main reason that Richard Tomlinson was fired was because he failed to wear a tie to a meeting with Serbian war criminal Radovan Karadzic. Seems a somewhat lame excuse to fire a top asset like Tomlinson don't you think? Truth of the matter is Tomlinson was fired because of what he knew and his objections to some of MI6's methods. While still working as an MI6 operative in civil-war torn Yugoslavia in 1992 Tomlinson became privy to assassination plans to bump off President Slobodan Milosevic by faking a car accident! The plan most favored with which to do away with Slobodan Milosevic involved arranging his limousine to crash in a tunnel using a strobe light to blind the driver. The location of the tunnel was strategic in that its narrow confines would greatly enhance the fatality rate and also an added bonus was that a tunnel would reduce the number of unwanted eyewitnesses! Does any of this sound vaguely familiar? Hmmmm...hang on isn't that the exact scenario for the Princess Diana crash! The assassination plot to kill Slobodan Milosevic via car accident never proceeded but such a scenario was kept on the back-burner for future use. What was more pressing for the MI6 Big Dogs was what to do with operative Richard Tomlinson. His apparent distaste for assassinating foreign leaders (even one as reprehensible as Milosevic) was most worrying indeed; it proved that he was an asset who could not be relied upon! By 1995 it had become evident to the British security apparatus that it was no longer a matter of "IF" but "WHEN" Princess Diana was to be killed! She was more than a thorn in the crown's side and the blasted woman had really become a downright nuisance! Little known to the British public MI5 and MI6 allegiance is more so to the monarchy than the British government! Routine surveillance of royal personage is standard for their "apparent" protection. Communication between the Royal Household and MI6 usually goes through the Foreign Office concerning requests such as threat assessments for Royals traveling abroad. This service incorporates the expertise of friendly intelligence services such as the CIA and NSA amongst others, to place members of the Royal Family under discrete surveillance ostensibly for their own protection. However there are less official channels of communication between the Royal Household and MI6. Richard Tomlinson had come across such unofficial channels between select highly placed MI6 officers and senior members of the Royal Family. Tomlinson had also come across an MI6 French informant who worked as security at the Ritz hotel in Paris. Subsequently he identified this informant as none other than Henri Paul, Head of Security at The Paris Ritz Hotel owned by Mohamed Al Fayed! Princess Diana Assassination Is A Go! With Princess Diana branded as a loose cannon and getting more and more out of hand as far as the British Royal Family was concerned, her hooking up with a Muslim with the intent to marry was absolutely the final straw for them! The woman just had to go! Furthermore with the extensive surveillance on Princess Diana it is certain that MI6 were well aware of Princess Diana's pregnancy and impending marriage plans. What is more they also knew of her plans to announce it to the whole world on the very day she was killed! However before the assassination plan could be set in motion MI6 had to get rid of that morality-stricken and troublesome operative Richard Tomlinson. If he had considered the assassination of a mass murderer (President Slobodan Milosevic) repugnant who's to know where he'd stand when it came to the assassination of a much beloved British Royal? Who's to say what kind of meddlesome problems he could cause? The man knew way too much about the assassination technique that was eventually employed and besides he'd been privy to data that made him quite knowledgeable about several of the players involved in the plot! Nope! Best thing was to fire him and pray that he kept his mouth shut. And if not,well goddamn it...this was MI6! With the full might of the British empire behind them (at least what's left of it) how hard would it be to contain one former operative? If he insisted on raising a ruckus he'd be duly dealt with! Well Tomlinson got the boot and so did Princess Diana, her case though was more permanent! As for Richard Tomlinson when he heard of Princess Diana's death he had little doubt that MI6 were involved and he thus felt a moral obligation to present what he knew to the subsequent inquiry into the crash headed by Judge Herve Stephan. Oswald LeWinter was a career CIA agent who was recruited into the agency during the Vietnam War. Much like Tomlinson, LeWinter grew disillusioned with The Agency (CIA) and was soon branded as rogue agent or a renegade. In April of 1998 Al Fayed's chief of security John McNamara (a former Chief Superintendent of Scotland Yard) met Oswald LeWinter in Austria. The purpose of that rather clandestine meeting was for McNamara to review some highly classified documents that LeWinter claimed to have in his possession. 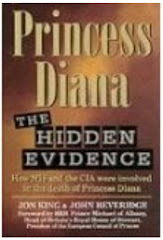 The documents that LeWinter claimed to have were secret CIA files that proved Princess Diana and Dodi Fayed were murdered and did not die in a simple car accident. According to Le Winter the files proved beyond any shadow of doubt that driver Henri Paul had been poisoned and that the Mercedes had been tampered with. Unlike Tomlinson however, who was driven by a moral obligation to reveal the truth, LeWinter expected a payday. He asked for $20, 000, 000 dollars if Mohamed Fayed wanted the documents. However before the transaction could take place LeWinter was nabbed by the FBI in Austria. Subsequently word filtered to the public that LeWinter had been nabbed while attempting to peddle forged documents! However that story doesn't quite ring true? First of all the FBI was way out of its jurisdiction, to be making arrests in a foreign country and why would they go to such lengths to to recover documents that were supposed forgeries. The truth of the matter is that LeWinter was given a choice: concede that the documents he had were forgeries and he'd only be charged with fraud. If he didn't play along then they'd slap him with the whole nine yards...high treason for the theft and intent to disseminate highly classified information! Naturally Oswald LeWinter played along especially when the subject of his family's safety cropped up! He was eventually sentenced to 24 months in an Austrian prison. In a sworn testimony, LeWinter stated that the documents presented at the time of his arrest as evidence against him most certainly were not the original documents he'd left in his room prior to his meeting with John McNamara, Al Fayed's chief of security! The point has been successfully disguised.Diana was murdered because an American Senator feared she would find out about his assault on her sons, which had occurred behind her back in 1991 and 1994. Americans instigated the "accident".